I know that lent starts tomorrow and traditionally it’s Pazcki Day here but I made pie. We blueberry pick every July between my hubby’s birthday and Meeshie’s. 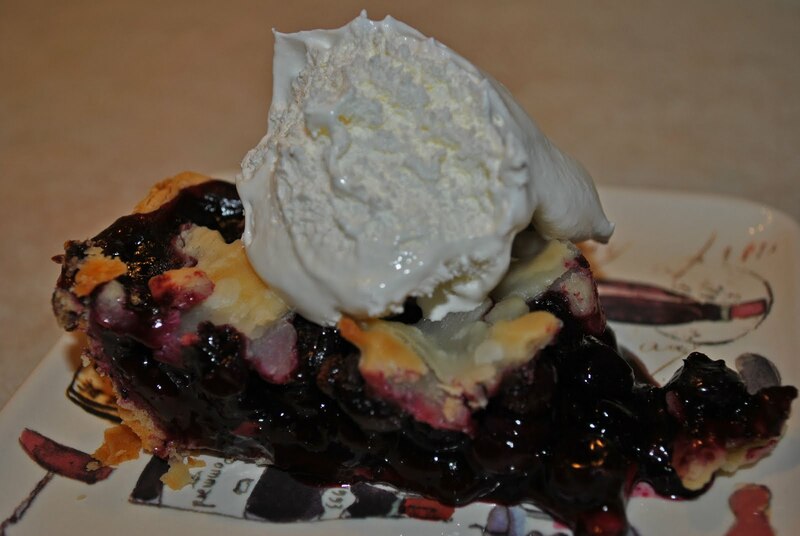 The blueberry farm is about 40 minutes from our house, out in farm country. Oh wait, that’s where we are! We love fresh blueberry and especially blueberry pancakes, but that’s another post. We go there and pick as many blueberries as we can and then we come home, I sort them, clean them and freeze them. This past year we picked 14 pounds! Of course it’s between my husband and me. Meeshie picks about 30 and then spends the rest of the afternoon eating them right off the vine. We brought a friend for her this year and it still didn’t motivate her to pick more. My husband and I have a contest of who picked the most and then spend the rest of the year talking about how we are eating the blueberries that we picked. Mix the sugar, cornstarch, salt, cinnamon and nutmeg together. Toss the blueberries in some lemon juice. Sprinkle the sugar mixture on top of the blueberries, mix. 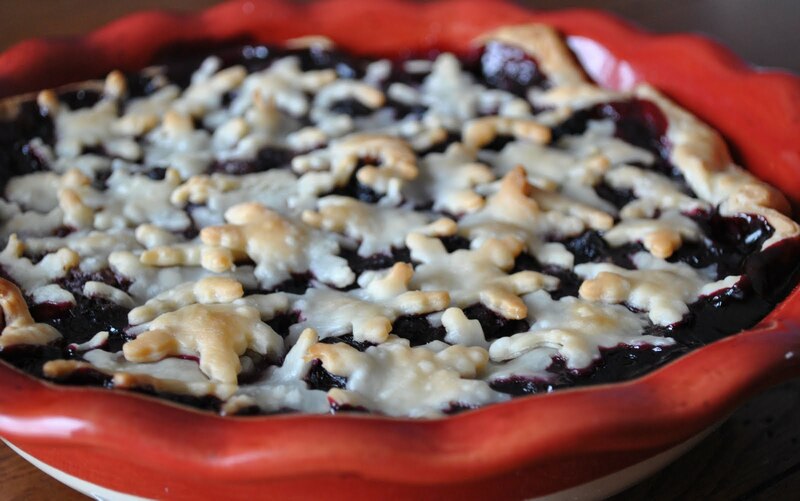 Line the dish with one of the pie crusts. Pour the blueberries in the curst and dot with butter. Cut the remaining crust with mini cookie cutter shapes. For this pie I used snowflakes. 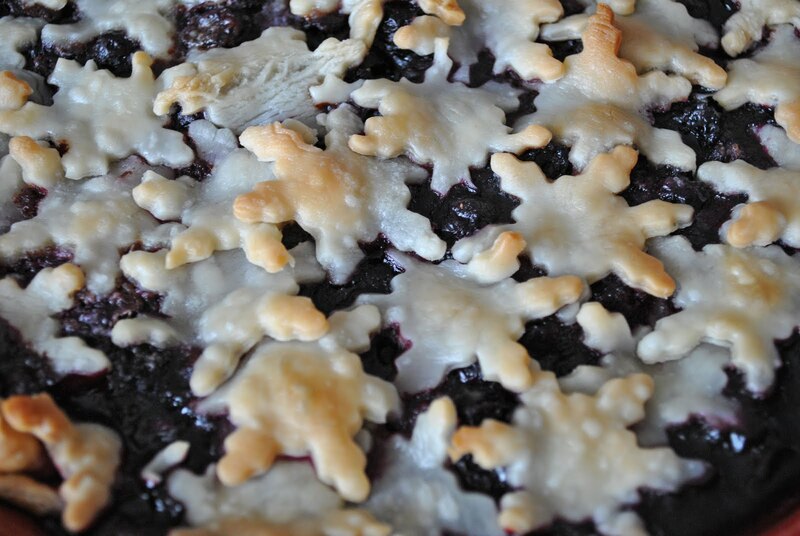 Place cut crust on top of blueberries until you have covered the top. Make sure to overlap the pieces. Bake the pie for 50 minutes, covering the edges with foil. Remove the foil for the last 15 minutes of baking to get it that nice golden brown.